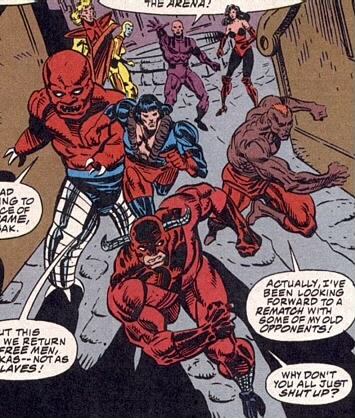 Base of Operations: The Pentagon, Washington D.C.
History: (Avengers I#370) - After Sersi crashed into Kro's office with a story about the Avengers being captured by the Deviant priesthood, Kro decided to activate members of his Delta Network to mount a rescue operation. Contacting Dragona, Tzabaoth, Enigmo, El Toro Rojo, Karkas, and Ransak (but decided against using Erishkigal, Metabo, and Blackwulf), and set for Lemuria. Enigmo, El Toro Rojo, Karkas and Ransak were sent to rescue the Avengers sent to the arena, while Kro, Dragona, Tzabaoth and Sersi set off to rescue the Avengers captured by the priests-- only to discover that the Deviant priestlord Ghaur had been resurrected, and had masterminded the entire operation! (Avengers I#371) - The team members sent to the arena managed to free the Black Knight and Giant-Man from the brain-mines that were controlling them, while Kro, Tzabaoth, and Dragona learnt from Ghaur how he planned to use Varua, Sersi, Hercules, Crystal, and Captain America in a Uni-Mind that he would control. Ghaur fought the assembled Delta Force with his new power, but when the Uni-Mind was cut open by the Black Knight, the submerged heroes were set free, and his powers were removed. In the aftermath, Delta Force left Lemuria, not able to complete their battle with Ghaur this day. Comments: Created by Glenn Herdling and Geof Isherwood. The Blackwulf depicted on Kro's monitor is Lucian, the second Blackwulf. However, at the time this story was published, Lucian had not yet made his first appearance, and was still a loyal operative of his father. It wasn't until the death of his brother Pelops-- the first Blackwulf-- in Blackwulf#1 (Jun. 94) that Lucian took up the Blackwulf identity and became a hero. It seems Herdling didn't mean for Blackwulf's appearance on the monitor to be anything more than a preview.